Neutral room schemes have been a perennial favourite for kitchens up and down the country. It’s not hard to see why. Classic designs are timeless and go with everything. And with modern kitchens being such hard-working spaces, it’s important to get the most out of the investment into the heart of your home. Another huge advantage of choosing white, off-white, grey and cream colour palettes for your kitchen cabinetry is that they can act as a blank canvas allowing you to play with creativity. 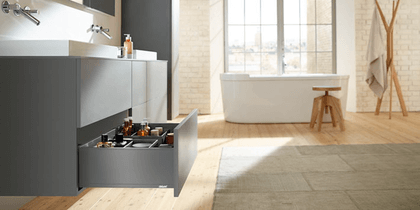 Why get a new on-trend kitchen when there are infinite opportunities to customise your perfectly serviceable, plain kitchen to your heart’s content? Here are some cool ideas on how to give your neutral kitchen scheme a colour makeover. From subtle accents to quirky statements, take inspiration from the examples below and switch up the energy in your kitchen. Your kitchen cabinets may be tame, but that doesn’t mean the walls have to be the same. Create dramatic impact by contrasting neutral furniture with unconventional colour choices on the wall. Set aside a weekend and head to your nearest DIY shop for the necessary supplies. Once you’ve chosen your paint colour, get some trial pots to test the colour in situ to make sure you’re totally happy with the result. You’re looking for a shade that’s bold enough to create contrast while not clashing with other colour schemes in nearby areas. Another option is to add or refresh a splashback. Brightly coloured splashbacks can create huge impact to nicely set off neutral kitchen units, whether you use traditional ceramic tiles or contemporary glass tiles. Take a look below at the way a bright orange sheet splashback (and matching fridge) has been used to inject high impact interest to a white kitchen scheme. These sheets are available in acrylic or glass and probably require professional installation, though if you’re only changing a small area of your kitchen the cost may be lower than expected. For a quick fix alternative that will give your plain kitchen an instant face lift, how about some eye-catching artwork? Choose a large, bold canvas or print with a bright motif that you love and hang it on the wall – simple! Kitchen shelves are probably one of the easiest and most underrated ways to bring new colours and textures into the room. While keeping your kitchen bits and bobs safely concealed behind closed cabinet doors is an excellent way to achieve that calm, streamlined look, open shelving can be used to create a focal point and draw the eye. Think of your shelves in terms of an art gallery and curate your ‘collection’ to achieve the exact look you’re after. We all have favourite items that are lingering in cupboards but should really be shown off. From glassware to heirloom china, junk shop finds to holiday mementos, pots and pans to kitchen utensils, candles, pictures, recipe books and much more besides – there are lots of things that look great on the shelf. Select your items and group them together in your chosen colour scheme to create something unique and personal. It is possible to enhance a calm colour scheme in the kitchen by adding just one standout item. If your kitchen has an area where freestanding furniture can go – say a breakfast table, dresser or other storage unit – or at least some wall space that can be personalised, you’re in for an easy win. Adding a piece of painted furniture in a contrast colour is one of the most effective ways to inject some oomph. If you’re the creative type, why not find a quirky vintage piece and colour customise it to add personality to your kitchen space? Choose a favourite paint colour and upcycle your kitchen table and chairs, a breakfast bench or antique cabinet. Alternatively, you could save yourself all the hard work and purchase a piece of furniture in the right colour, or add your kitchen designer to make a bespoke unit, transforming your kitchen from boring to adoring. Adding a pop of colour to your neutral room scheme doesn’t get any easier than putting a rug on the kitchen floor. We wouldn’t necessarily recommend that you invest in an expensive Persian carpet since kitchen floors have to be able to withstand a spillage or two. Much better to choose a brightly coloured non-spill indoor/outdoor rug that is easy to keep clean, or a cheerful rag rug that’s cheap to replace, or even a pretty vintage rug where the odd stain merely adds to the character. As an added bonus, putting a soft rug in the kitchen will feel warmer underfoot than hard flooring, making your kitchen a nicer place to be. That said, rugs and carpets are not the only floor treatment open to you in the kitchen. If you prefer the practicality of hard floor coverings, you can always paint wooden floor boards in a colour of your choosing, or replace tired vinyl flooring with pretty LVT tiles to add a pop of colour. Finally, if your kitchen needs an injection of fresh energy, an obvious place to look for help is the natural world all around us. Simply by adding some bright blooms, lush green foliage or even fruit and vegetables, you can enliven your room scheme in no time at all. Choosing greenery could be as simple as pots of fresh green herbs on the windowsill, a colourful bouquet of cut flowers on the dining table, or a stylish glass bowl with produce in vibrant colours placed on the kitchen island. Nature’s bounty comes in a veritable rainbow of colours – yellow lemons or bananas, oranges and pumpkins, red or green apples and so forth. Bring the outdoors in by placing pot plants or indoor trees in your kitchen. From elegant purple orchids to statement succulents and lush palm trees in planters, there’s a wealth of plants that you can use. Add as little or as much as you like to soften the room or go full urban jungle. To complete the look, team with natural materials such as wood and rattan, glass and stone for a neutral yet natural look that’s anything but boring.